Cheap Disposal of Your Old Beds, Mattresses, Furniture, etc. Stress Free & Easy Junk Removal. Got an Old Bed or Mattress to Remove? As most people are aware, modern society likes to throw away a lot of things. If something doesn’t look quite as good as it should, whether it be food, clothing/accessories, or furniture, the first thought can often be to replace it. Most of our decisions on whether something needs to be tossed out are based on aesthetics (and obviously its working condition). Despite spending a whole lot of time on it, something people often overlook is their own mattress. Bed bases should be built tough and last for years, much longer than the mattress that sits on top of them, yet these two items are often replaced at the same time. Most mattresses have a life of less than 10 years due to the type of product they are – in the right conditions they can be a breeding ground for mould and other nasty things (bed bugs are real), and with the everyday use, the foam can start to break down. We’re not encouraging you to throw more things out, but it may be worth considering upgrading your mattress before you replace your whole furniture set to match your new décor! If you need your mattress or bed base gone, call Same-Day Rubbish Removal on 0402 737 046 for fast and affordable mattress removal. One of the reasons beds and mattresses are often used much longer than other furniture and related items is due to their size. A king size mattress can be quite tricky to move, and there’s no hope of fitting it in a small car to take to the tip. It can be easier to just cover it up with a nice sheet and pretend there’s nothing wrong with it. Our experienced team here at Same-Day Rubbish Removal make mattress removal, and removal of beds and other large items incredibly easy. All you have to do is call us up, arrange a time, and we’ll be there to take your junk away. You just need to point out what needs to go and we’ll do all the heavy lifting for you. We’ve had years of experience removing large items form Sydney homes and business and nothing has been too hard yet – we’ll get that bed and mattress out in no time. 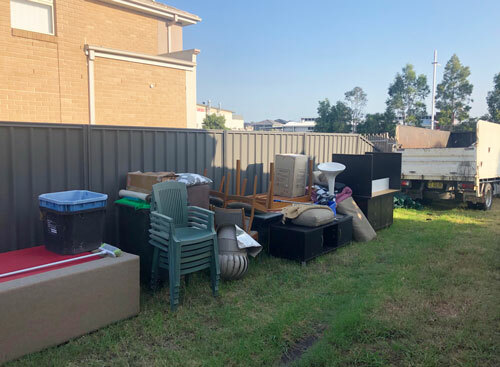 Our experience has helped us create the most efficient junk removal service in Sydney, meaning we offer the best value rubbish removal. Don’t waste any more time – have Same-Day Rubbish Removal solve your junk problems. According to Elite Daily, there are several effects poor sleep can have on you. A lack of sleep can lead to the following problems, if you think any may be affecting you, it could be worth looking into a new mattress! With age, mattresses lose their structure and offer less support to your body. This can cause back pain, buying a new mattress has been shown to reduce back pain. This lack of support can lead to blocked airways causing snoring; mattresses are often overlooked when trying to find the cause of snoring. If you're looking to buy a new mattress, you might like to read about the differences between new and old mattresses. Your mattress can trigger allergies – they’re a breeding ground for all kinds of things! Bed bugs are real, if you start getting small red bites, you know you have to do something. It’s also estimated that up to 10 million dust mites can be living in a mattress, feeding on dead skin cells. These dust mites can cause allergic reactions particularly for people who suffer from asthma. Bacteria, moulds and fungus can also thrive in old mattresses, and there’s a whole range of issues that these can cause. Our exceptional service is offered to businesses and residences right across Sydney. Whether you’re located down in the Sutherland Shire, a business in Sydney’s CBD, or a home up on the Northern Beaches, our team has you covered. We see lots of old furniture, e-waste, and whitegoods, along with a huge range of other interesting items. 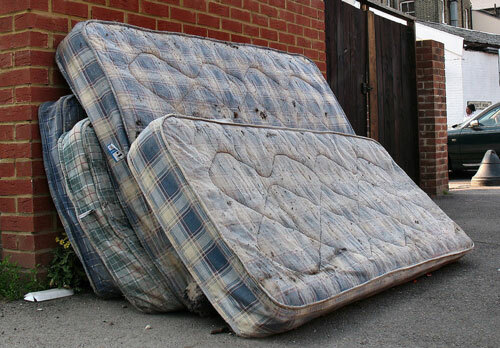 Wherever we can we try to make sure your rubbish is recycled or disposed of in the most responsible way possible - fortunately mattresses can be recycled too! Don’t let your trash sit there any longer, call and chat to someone from our team. We can’t wait to help you get your mattress removed and your property cleaned up – call Same-Day Rubbish Removal now on 0402 737 046.